I've had some good nights playing in online casinos but never have I been able to one dollar into forty thousand dollars like a regular at Intertops Casino did recently. Christian H., a 36 year old dad, started with just $1.51 in his account on Thursday night and by Friday night he had nearly $40,000 in his account. 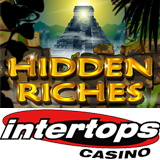 Christian was playing his favorite slot game, Hidden Riches. He won several jackpots ranging from $3000 to $6000 and pocketed $10,000 during free games. Rather than dreaming of spending his winnings on extravagant luxuries, as many would be tempted to do, Christian said he plans to do what many winners say they’ll do these days: pay off his credit cards. Intertops Casino has hundreds of games from Realtime Gaming Wager Gaming but with the excitement of World Cup being felt all over the world, it’s not surprising that the new football-themed slot game, Football Frenzy, is the runaway favorite this month. Until June 25, you can get an up to $100 casino bonus to try it by entering coupon code FRENZY when they deposit. Intertops Casino’s $180,000 Samba Soccer casino bonus giveaway continues until the end of the World Cup football championship in Brazil. Earning points just by playing any of the main casino’s games, top scoring players are winning $30,000 in casino bonuses every week during World Cup. Many more are winning extra bonuses by predicting World Cup winners.